Indian Army has released the notification of Indian Army SSC Tech 52nd Men 23rd Women 2019 for married / unmarried Male and unmarried Female Engineering Graduate and also from Widows of Defence Personnel for grant of Short Service Commission in the Indian Army in all Arms / Services. The course will be started in April 2019 at Officers Training Academy (OTA), Chennai, Tamil Nadu. Eligible candidates who wish to Join Indian Army after engineering can apply for Indian Army SSC Tech 2019. The application form is available from July 12 to August 09, 2018. Join Indian Army recruiting directorate is to decide cut off to hold selection rounds. Get here complete details of Indian Army SSC Tech 52nd for Men 23rd for women April 2019 including notification, application form, admit card, result, merit list, cut off. Latest: The Application Form has been released, apply online from the “Application Form” page. In view of Indian Army SSC Tech 2019 being for 52nd Short Service Commission for Men and 23rd Short Service Commission for Women; candidates popularly refer to it as Indian Army SSC Tech 52nd. Sometimes they may also call it only Indian Army SSC Tech 2019. At other times, applicants refer it to as Indian Army Engineering Recruitment 2019 SSC Tech. All in all, we can call them also as Indian Army Short Service Commission Notification 2019. 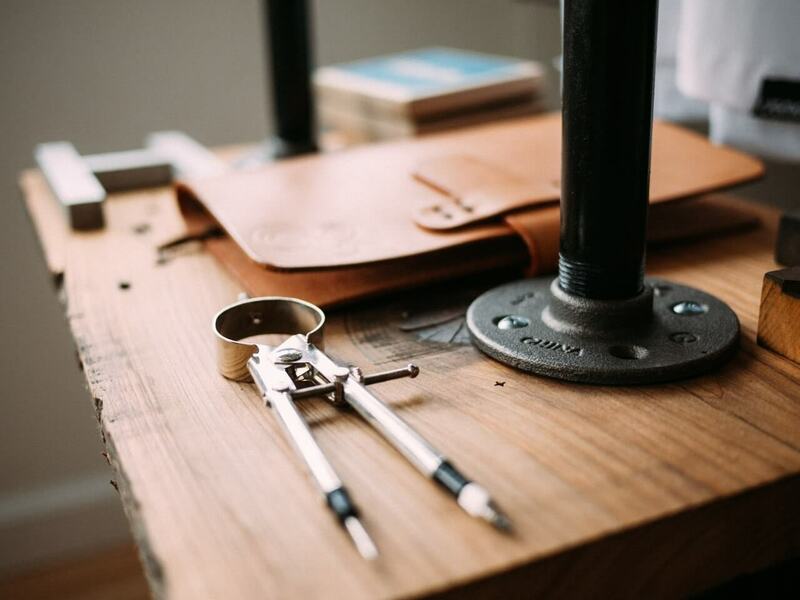 Educational Qualification – Candidates who have passed Engineering Degree course or are in the final year of Engineering course are eligible to apply. Selection Process – Integrated HQ of MoD (Army) reserves the right to shortlist applications and to fix cut off the percentage of marks for each engineering discipline without assigning any reason. How to Apply – Application Form of Indian Army SSC Tech 52nd Men 23rd Women 2019 can be filled online at Indian Army website. There is no need to pay the Application fee. Application fee – As fixed by Join Indian Army. Indian Army will release application form for SSC Tech 52nd Men and 23rd Women for April 2019. The application form will be available on the official website from July 12 to August 09, 2018. Interested candidates can directly apply through the link given above. Educational Qualification: Candidates who have passed Engineering Degree course or are in the final year of Engineering course are eligible to apply. The candidates studying in the final year examination of Degree Course should be able to produce the Engineering Degree within 12 weeks from the date of commencement of training at OTA, Chennai & TamilNadu. Admit card of Indian Army SSC Tech 52nd is an important document. Candidates can download Indian Army SSC Tech Men and Women 2019 Admit Card from joinindianarmy.nic.in. As much as the call letter is important, so are other documents that are asked for by the Join Indian Army. Although the Indian Army will prominently notify availability of admit card. Notwithstanding, it is the responsibility of the candidate to obtain Indian Army Admit Card 2019 on time. 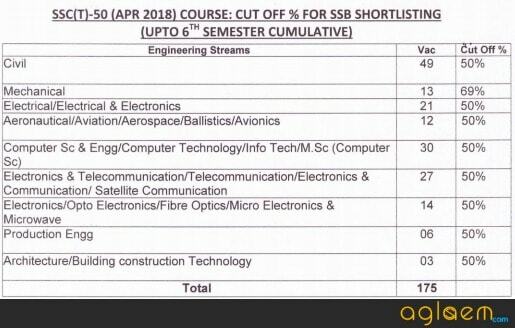 Integrated HQ of MoD(Army) reserves the right to shortlist applications and to fix the cutoff percentage of marks for each engineering discipline without assigning any reason. Candidates will put through the two-stage selection procedure. Those who clear Stage I will go to Stage II. Those who fail in Stage I will be returned on the same day. Duration of SSB interviews is five days excluding day of arrival. Height & Weight: The minimum acceptable height and weight for men is 157.5 cms with correlated weight and for women, the http://www.joinindianarmy.nic.in/default.aspxcandidate is 152 cm and 42kg. In case of candidates belonging to the North East and hilly areas like Gorkhas, Nepalese, Assamese and Garhwalis, the height will be relaxed by 5 cms and weight commensurate with reduced height. In case of candidates from Lakshadweep, the minimum acceptable height can be reduced by 2 cms. Rope climbing – 3-4 meters. A candidate recommended by the Services Selection Board will undergo a medical examination by a Board of Service Medical officers. Only those candidates will be admitted to the academy who are declared fit by the Medical Board. Indian Army SSC Tech 52nd Men and 23rd Women cut off will be declared after the examination of the exam. Those candidates who have appeared in the exam will able to check the cuff off marks. After the cut off marks, who will have cleared the exam, will be procced for the next medical round. Join Indian Army has decided the cut off for Indian Army SSC Tech 51. 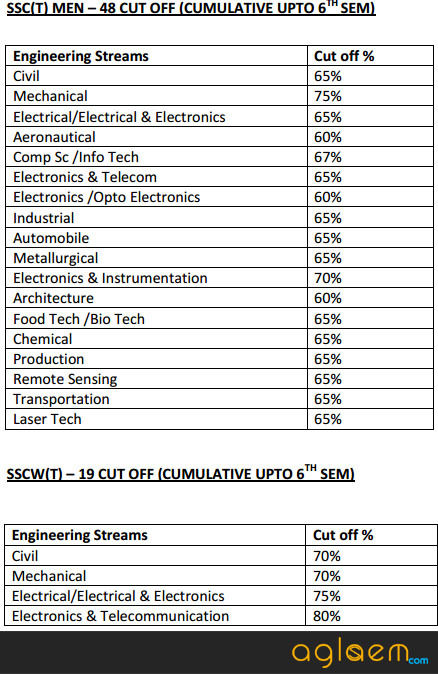 The details of the various disciplines and vacancy along with cut off is provided below. Join Indian Army has decided the cut off for Indian Army SSC Tech 50. 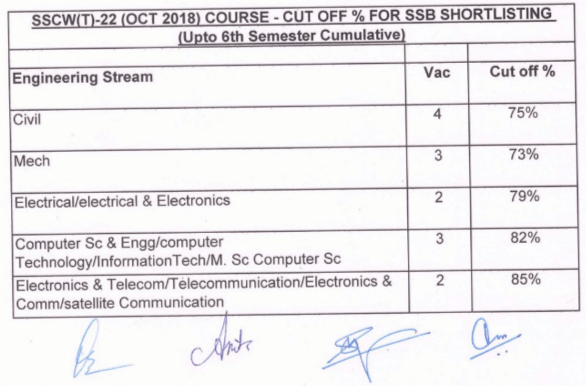 The details of the various disciplines and vacancy along with cut off is provided below. Join Indian Army decides Cut Off for SSC Tech. 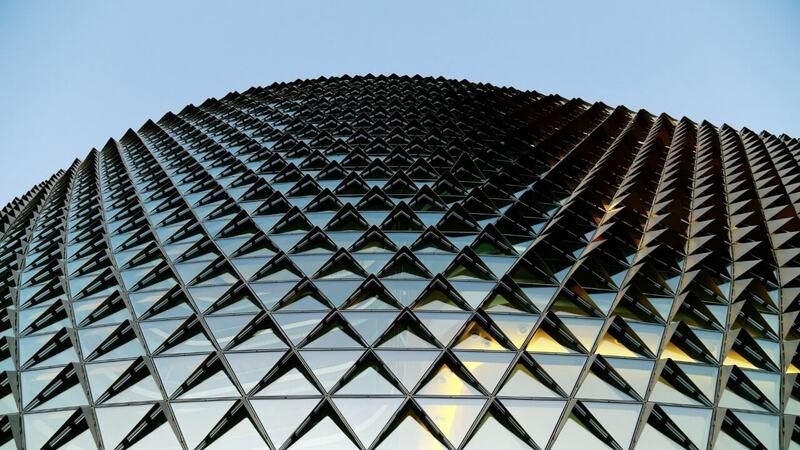 While they apply cut off percentage, they take the decision on basis of various factors. To begin with, they take into consideration points such as the minimum requirement of Indian Army, vacancies, number of applicants. Further department wise cut off is fixed. 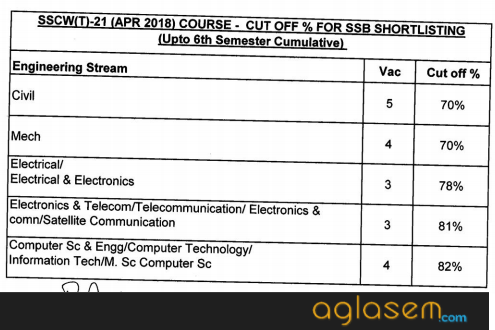 Indian Army has published Cut off for Indian Army SSC Tech 49 on March 29, 2017. 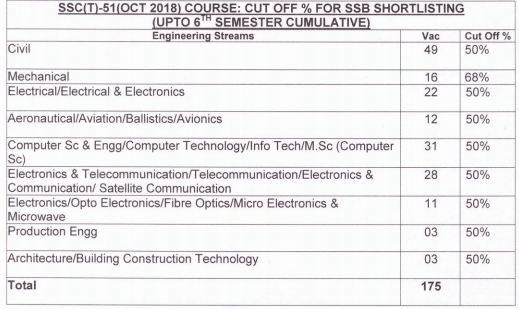 Indian Army has published Cut off for Indian Army SSC Tech 48 on October 7, 2016. Official Notificaiton: Click here to check the Advertisement. Just one Query…I have given my 6th sem exam,branch ECE and My 7th sem will start from Aug.
Can i apply for this entry (SSC 52 Tech)….? Kya SSC 52 Tech ko sms ya mail aai hh kya?? ?